GOAL - 100% OF HOMEOWNERS RESPOND IN WRITING TO #FRAUDclosure NOTICES ASAP ! E M B E Z Z L E M E N T ! THANKS FOR YOUR INTEREST IN THIS DEVELOPING LITIGATION. 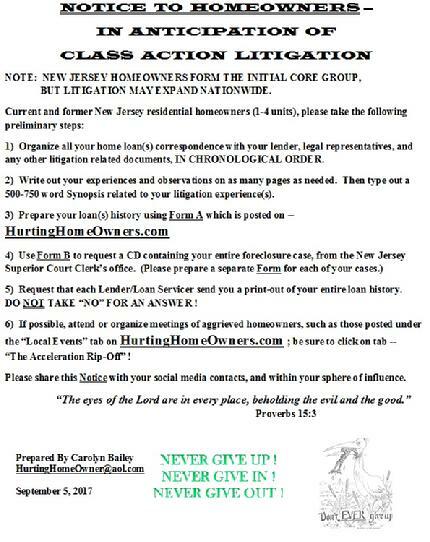 AS YOU ARE COMPLETING ALL THE PRELIMINARY STEPS, PLEASE JOIN IN MEETING WITH OTHER AGGRIEVED HOMEOWNERS. EVERYONE'S INPUT IS VITAL. BE SURE TO CLICK ON THE "LOCAL EVENTS" TAB. BUT PLEASE DO NOT FORWARD YOUR CASE INFO TO ME. HOLD ON TO YOUR MATERIALS UNTIL LITIGATION DEVELOPS.